In a deal that secures a long-term future for battery-powered trains in the UK, Hoppecke Industrial Batteries and Vivarail have confirmed that they will be working together to design and integrate batteries to power Vivarail’s Class 230 passenger trains. In October this year Vivarail launched the UK’s first passenger train powered by a mobile charging unit developed by Hoppecke, the UK’s industrial power specialist. The train carried hundreds of passengers on an arduous route across Scotland. The event demonstrated that Hoppecke’s Lithium-ion batteries are ideally suited to the most challenging routes, providing the rapid charging needed for battery-powered journeys. This new deal cements the long-standing relationship between the two companies, and secures long-term commitment for developing battery trains for the UK rail industry. Adrian Shooter, CEO of Vivarail, said “We are delighted to be working with Hoppecke, which is a company with similar values to our own and a strong reputation in its market for innovation, building customer relations and genuinely smart products. The Class 230 train utilises Hoppecke’s Battery Energy Storage System (BESS), which stores electrical energy and then, when the train comes into a station, pumps 1MW of energy in just eight minutes – sufficient to provide a robust 65-mile range. As well as demonstrating that battery trains are truly fit for service, new information was collected on the Scottish route, allowing Vivarail and Hoppecke to assess performance data for the batteries. The train also benefits from regenerative braking, absorbing the energy used in braking and regenerating it back to power the train. Simulations and performance data show that many non-electrified routes can be operated by the Class 230 battery trains for emission-free travel. This means that the costs of both infrastructure upgrades and daily operation are hugely minimised – in some cases by millions of pounds. 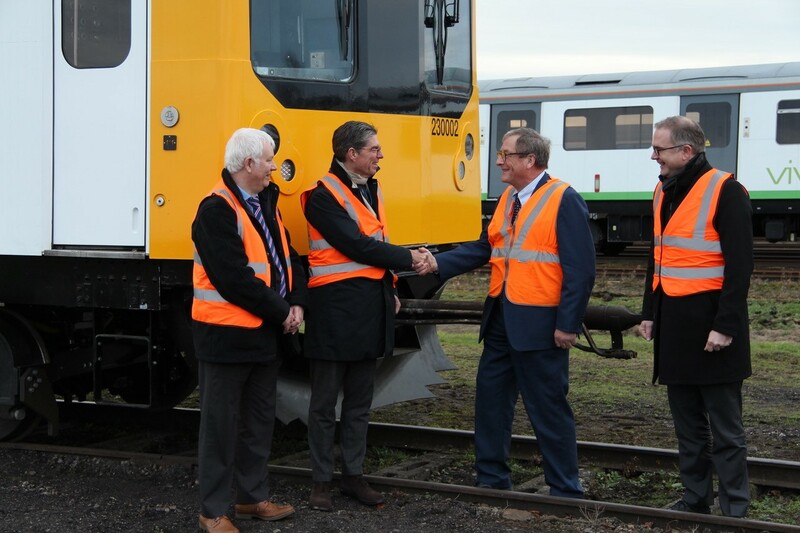 Jon Bailey, managing director of Hoppecke UK, said, “At Hoppecke we are excited to support Vivarail, the UK’s leading battery train manufacturer, in this ground-breaking endeavour. We have developed a strong, collaborative relationship and were excited to develop our BESS mobile charging unit for the project when Vivarail launched the only battery-powered train available in the UK earlier this year. In light of the UK Government’s aims to phase out diesel trains by 2040, battery-powered trains are an emission-free alternative for economic rail travel, especially in areas where electrification is either non- or only partially existent. The trains are particularly well-suited to urban routes where authorities wish to eliminate pollution caused by traditional DMUs as well as scenic lines where the natural environment needs protecting. Currently, Vivarail is building a fleet of diesel/battery hybrids to operate the Wrexham-Bidston line for Transport for Wales, where the diesel gensets will be used to charge the batteries not to power the train. Designs for other types of hybrid trains exist and a new hydrogen variant is being developed which, similarly to the diesel hybrid, will exceed the pure battery train’s range of 65 miles. Hoppecke specialises in power supply and energy management solutions and, from its facility in Staffordshire, carries out battery assembly, sales, rental, refurbishment and servicing.